1 drawing on paper : ink ; image 10 x 14.5 in., matted 16 x 20 in. A woman with flipped forelock of hair, Mine Okubo, sits at a table listening to refugees retelling their experiences on the last boat leaving Bordeaux, France for America before the United States entered World War II. 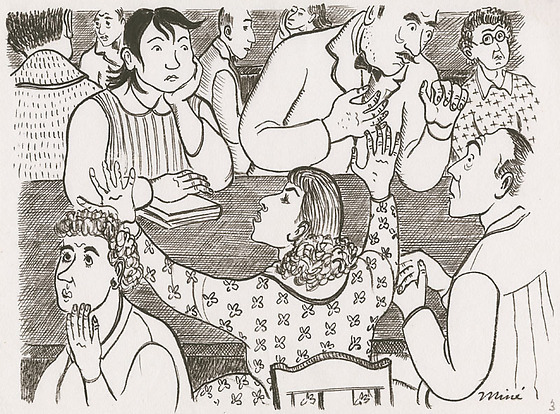 Dressed in a striped pinafore over collared blouse, Mine rests her chin in proper left hand at top left listening to woman seated across the table gesturing with open arms with her back to viewer, center. A man with worry lining his face sits with hands clasped at bottom right. Another woman holds her hand to her face at bottom left. Mustached man in bowtie sits next to Mine talking to someone else as older woman wearing glasses listens at far right. Four other people talk in background behind Mine. Signed at bottom right corner: Mine. Written in pencil, bottom right corner: 3. Written and circled in pencil, bottom left corner: 3. Stamped in black ink on back, top left corner: 5191. Written in pencil on back, bottom right corner: 3. Drawings for the book, Citizen 13660, began as sketches and drawings created by Okubo while incarcerated at Tanforan and Topaz to tell faithful friends about camp life and were intended for exhibition purposes. Drawing is on page 5 of book.